Former Bafana Bafana defender Bongani Khumalo is training with SuperSport United but only to keep himself fit, according to his agent Glyn Binkin. Khumalo is currently a free agent after parting ways with Premier League side Tottenham Hotspur recently. However Binkin has said that the Manzini-born defender is heading back to England again in the next few weeks, and is only trained with Matsatsantsa to keep in shape. "Yes, he is training with Supersport, but only to keep fit,” said Binkin. "He should be going back to England in the next two to three weeks.” Binkin was however mum over what the defender’s future might hold. “We have a couple of options that we currently looking at,” he says. Former Kaizer Chiefs midfielder Steven Ncanana has returned to professional football after signing with first division club Thanda Royal Zulu. Since being offloaded by Chiefs three years ago, Ncanana has played for Blackburn Rovers and spent the past season with Milford FC in the ABC Motsepe League. Thanda have also signed Mzwandile Banda from Maluti FET College. Meanwhile, the club has confirmed that Asanda Mvalo will assist Thami Ngubane, who has returned as head coach. Ngubane left during the course of the past season to join Royal Eagles where he didn’t last long and has since decided to come back to his former club. Bafana Bafana keeper Itumeleng Khune is calm over his next move after his contract with Kaizer Chiefs came to an end last week. Khune captained the Bafana team that beat Mauritius 2-0 on Sunday and 5-0 on aggregate to reach the last round of the 2016 CHAN qualifiers where they will meet Angola for a place in Rwanda. "I just got back [from Mauritius]. I still need to speak to my agent and see what he has on the table," Khune said. "We [my agent and I] get to communicate everyday but I can't reveal what we've been discussing. It's still early days for that," he added. With most clubs in pre-season camp gearing up for the 2015/16 season, Khune says he will keep fit on his own while he plots his next move. I go to gym a lot and whoever comes and asks for my services, I'll be ready,” he said. "It's part of the game - I guess I just have to be strong with the situation I'm facing right now, but something will come up in the coming weeks. I'm healthy and I still have a lot to offer and it [my future] will be sorted out." The 28-year-old refused to be drawn into the speculation of him going back to Naturena with recent reports suggesting that the two parties could re-open negotiations over a new deal. "I can't answer that,” he said. “At the moment I'll go back home and relax. Tomorrow I'll start doing some gym work." Orlando Pirates goalkeeper Philani Zikalala is heading back to his hometown of Durban to join Golden Arrows in a move that will then lead to Nkosingiphile Gumede heading out on loan to Thanda Royal Zulu. Arrows are thin on experience between the posts upon their return to the PSL and have identified Zikalala as the best option to aid them. Zikalala has fallen further down the pecking order at Pirates where he is now fourth choice behind Brighton Mhlongo, Siyabonga Mpontshane and new signing Felipe Ovono. Having failed to play a single game last season Zikalala is aware that his fortunes will not be getting better this season and has welcomed the move to Arrows where he stands a chance of at least getting to play. Arrows currently have Gumede, Ricardo Goss and Namibian keeper Maximilian Mbaevu but they know very well about the need to strengthen. Zikalala arriving in Durban will lead to Gumede moving to Thanda – who are in need of a goalkeeper and who have made their intentions known to Abafana Bes’thende. SuperSport United attackers Benett Chenene and Thabiso Nkoana have been sent to train with the club's development side. Chenene and Nkoana spent last season on loan at University of Pretoria and Ajax Cape Town respectively, with the pair reportedly not in coach Gordon Igesund's plans for 2015/16. Chenene has been linked with a move to Polokwane City as part of a swap deal involving Puleng Tlolane. Ricardo Katza is in charge of Matsatsantsa's second team, which campaigns in the MultiChoice Diski Challenge. Kaizer Chiefs attacker Bernard Parker believes he still has "a lot to give to Bafana Bafana". The 29-year-old did play no part in Sunday's 2016 Chan qualifier with Mauritius, having largely been overlooked by Shakes Mashaba since the mentor's return to the Bafana hotseat in September last year. Parker did compete at the 2015 Africa Cup of Nations, but was restricted to just two substitute appearances at the continental tournament. However, Parker, who scored eight goals for Amakhosi last season, feels his record shows he can still make an impact at international level. “I do feel that I still got a lot to give to Bafana Bafana. I have proven over the years,” Parker said. “I have proven with different coaches and I have proven this time around where I scored vital goals when coming back from a crazy injury. If the coach gives me a chance, I will definitely go out there and do what I have always been doing for Bafana.” Parker, the PSL's Golden Boot winner with 10 strikes in 2013/14, has netted 23 times for Bafana in 68 outings. 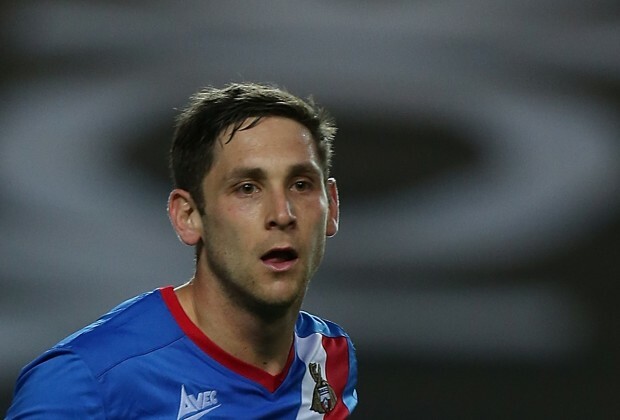 Dean Furman, in a friendly game against Accrington Stanley this weekend. The 27-year-old is currently training with Rovers as he looks to try and secure a contract in Lancashire after leaving Doncaster Rovers at the end of last season. Now, with his presence at the club’s training being confirmed, the Lancashire Telegraph is reporting that Furman will spend the rest of the week training with Blackburn, before being tested in this weekend’s pre-season friendly. Furman made it known when he decided not to agree to a new contract at Doncaster that he wanted to make the step up from League One to the Championship, and he will now be hoping to put in a good performance this weekend and persuade Bowyer that he is worthy of a contract at Ewood Park. 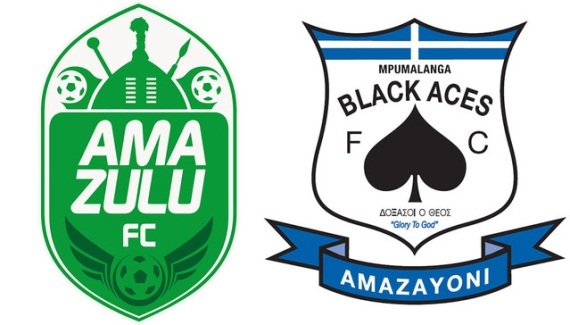 Platinum Stars have stretched their hands into the market by bringing in Mbongeni Mzimela, Siyabonga Zulu and Kulegani Madondo. Goalkeeper Mzimela joins the club straight after he failed to agree terms on a new contract with Chippa United, where defender Zulu also spent the past season. All three players join as free agents following the expiry of their contracts at their respective clubs. Mzimela comes in to reinforce a goalkeeping department that was left thin following the departure of Siyabonga Mpontshane to Orlando Pirates in January. Mzimela started 24 games for Chippa last season. Zulu will come in at left-back after having put in an encouraging shift at Chippa last season, starting 17 games. The 21-year-old has been brought in following the departure of Luvolwethu Mpeta to SuperSport United in January, while Punch Masenamela’s contract was not extended after the expiration of his loan deal at the club. Madondo has been roped in to tighten the midfield and joins on a free after the expiration of his contract at relegated AmaZulu. Golden Arrows have snapped up Thanda Royal Zulu defender Velile Zitha, who will join the Durban-based club on a three-year deal. Zitha has joined the PSL returnees after an impressive shift in central defence this past season and is already training with Arrows. The 25-year-old has been a standout performer and ranks amongst the most consistent defenders in the First Division over the past three years. Midfielder Kuduku Maleasenya, formerly of NFD team Baroka. These are not the final signings for this season. Chippa plans to sign more players in the weeks to come.” Chippa also announced they have enlisted PUMA as its new apparel partner. Bloemfontein Celtc striker Lerato Manzini has also joined the Chilli Boys on a three-year deal. Zimbabwean striker Matthew Rusike says he will always be grateful to the Kaizer Chiefs family for allowing him to further his career. Rusike, who recently signed a two-year contract with Portuguese topflight side CD Nacional Madeira, left for his new base on Friday, but not before he could thank the reigning Absa Premiership champions. “I remain grateful to Chiefs for allowing me to progress in my career, while also thanking my former team-mates for improving my game to such a level that I can now play in Europe,” says the 25-year-old. “The Chiefs family was good and supportive throughout my career with the club. I have moved on, but I will always miss my days in the Amakhosi set-up. Rusike, who has played in England, says he will not have a difficult time adjusting to the weather in Europe. “The weather, language and adjusting to Portugal shouldn't be a problem for me because I have played in Europe before,” he said. Bafana Bafana attacker Siphelele Ntshangase looks set to complete a move to Orlando Pirates from Black Leopards. Ntshangase's agent Mandla Mthembu says talks are at an advanced stage with a "top team" in Gauteng. “All I can say is that Ntshangase will be moving to one of the teams in Gauteng,” Mthembu said. “We are at an advanced stage with one of the teams and I can tell you that he will be in Gauteng joining one of the top teams.” The 22-year-old midfielder has been linked with a switch to Pirates and Mamelodi Sundowns. But according to a well-placed source, Bucs look to have won the race for his signature. “Pirates and Leopards met last week and it seems they have agreed that the player will join them and could unveil him soon,” the source said. Ntshangase played in Bafana's 2-0 victory over Mauritius in a CHAN 2016 qualifier on Sunday. South African Darren Holden will be playing in the Scottish Premier League next season after joining Ross County. It is a major step up for the 21-year-old, who swaps the fourth tier in England for matches against the likes of Glasgow Celtic. The Krugersdorp-born right-back has signed a two-year deal with the Scottish club having made 61 appearances for Hartlepool since April 2011. He made his debut as a 17-year-old and also played for Pool during their spell in the English League One. His new side Ross County are from the Scottish Highlands and finished ninth in the 12-team division in the 2014/15 season. Free State province were crowned SAFA/SAB Under-21 Champions after beating Mpumalanga province 3-1 on penalties after an exciting Final at Giant Stadium on Saturday. Free State has now won the tournament for the second time in succession after they won it last year. The teams were locked at 1-1 during regulation time before the referee ordered the teams to go for penalties, where Free State proved superior. Maritzburg United chairman Farouk Kadodia has handed an ambitious mandate to new coach Mandla Ncikazi, who has been promoted from his previous duties as assistant coach. Kadodia wants to see the club compete more form PSL honours and also remain in the top eight this season. With the club last season having finished in the top eight for the first time in their history, Kadodia feels the team can now challenge for silverware and join other established sides in the league. "We achieved the top eight status for the first in the club history, and we improved support during midweek and weekend games – with the average going from 3000 to 6500 fans," says Kadodia. Under the leadership of our former coach [Steve Komphela], the foundation was made, which is the currently the ambition and the vision of the club. It is therefore very important that we build on that foundation and be consistent in our approach, style of football and attitude." Kadodia also alluded to fact that there was no chance the club would have gone for a foreign coach, and reveals that continuity was the key in choosing Ncikazi as the new head coach. "We were guided by two issues; continuity on the foundation that has been laid [by Komphela], and a young and ambitious coach with hunger to achieve and be counted on the PSL scene," he adds. “As a board of directors we considered our next step very carefully because it was an important transition for our football club. Having gone through the process, we unanimously agreed the timing was right for Ncikazi to be offered the job. We put our money on this coach as he was part of those who laid the foundation for our growth." Ncikazi's appointment was ground breaking in South African football, as it means all PSL clubs that finished in the top eight last season will now have local coaches at the helm. Ncikazi is up for a baptism of fire, as he prepares to face his former colleague Steve Komphela when Maritzburg clash with Kaizer Chiefs in the MTN 8 quarter-finals in the first week in August. New York City are likely to offer a deal to former Kaizer Chiefs defender Tefu Mashamaite following his 10-day trial period. Mashamaite started training with Manchester City’s expansion franchise in the United States on Wednesday and was pictured in action alongside marquee midfielder Frank Lampard. There are strong indications that a deal for Mashamaite is likely to happen as the new MLS side is known to be looking to bolster their defence, a problem area for the fledgling team, who are playing in their first MLS campaign. Currently Manchester City youngster Shay Facey and American defender Jason Hernandez are the first-choice pairing for coach Jason Kreis’ team, but Mashamaite is reportedly being earmarked for the latter’s position. Mashamaite, strong in the air and the tackle, a good reader of the game and reliable with his distribution from the back, is exactly the type of defensive player the club is looking for. Sources close to the club say their main weakness at the back has been at set-pieces, both defensively and offensively – an area where Mashamaite excels – as well as in poor distribution and possession from the backline. With Lampard in midfield and Andrea Pirlo’s arrival reportedly imminent, City will need more experienced defensive players who are also comfortable in possession to complement their possession-style game. Mashamaite would also be a good foil for his potential centre-back partner Facey, who is shorter but has more pace than the taller, more seasoned Mashamaite. Former United States and AC Milan centre-back Oguchi Onyewu was previously training with the club but is now injured, opening the door for the free agent PSL Footballer of the Season. Odds are the club will take a calculated gamble on 30-year-old Mashamaite, with sources estimating the South African could easily be offered up to $200 000 a year (R205 000 a month), or more, depending on whether he is signed as a starting player and which player in their current roster he replaces. MLS teams have a total salary cap of $3.49-million for the first 20 ordinary players in their squads, not counting three Designated Players (DPs) like Lampard, who earns far more (reportedly $6-million). The maximum a single ordinary player can earn (without a special ‘buy-down’ from allocation money) is $436 250 a year (R447 000 a month). Also working in Mashamaite’s favour is that young loanee Facey is likely to return to Manchester at the end of the MLS season in October, meaning another centre-back will be needed in future whether in the starting line-up or not. The club has recently signed Jose Angel Tasende – known as Angelino and also from the Manchester City development ranks – as their new left-back, with experienced ex-Athletic Bilbao right-back Andoni Iraola signed for the other side. New York City are at the halfway point of the MLS season and are second from bottom in the Eastern Conference with 17 points from 17 games and 15th overall from 20 teams. David Villa has scored six goals in 14 appearances for the club, while Lampard will make his debut on July 12 against Toronto FC. There is huge interest from a number of clubs in Europe for Mamelodi Sundowns forward Nyasha Mushekwi following his impressive stint with Swedish club Djurgardens. Sundowns are being flooded with enquiries by clubs from Germany, France and Holland about the availability of the 27-year-old, who is on loan to the top-flight Swedish side. Mushekwi – who is the leading scorer in the Swedish Allsvenskan with 10 goals – now looks set to leave the Brazilians permanently. Mushekwi – who has scored 40 goals in 53 starts for Sundowns – joined Djurgardens in March after spending the first half of the 2014/15 season without playing any competitive football. 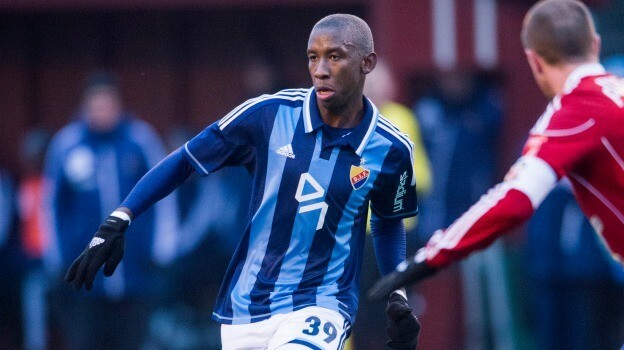 Djurgardens sporting director Bosse Andersson has previously been quoted saying the club is prepared to rope in the Zimbabwean international on a permanent basis. Thuswa says Mushekwi’s future is likely to come into sharper focus in November when the curtain eventually comes down on the Swedish League. Three young South African players from an academy that is funded by Kaizer Chiefs midfielder Reneilwe Letsholonyane are in England for trials. Striker Nimrod Ofentse Ngema (17), right-back Lunga Innocent Tshabalala (18) and centre-back Kopano Matlakala (17), who are from the Meadowlands Academy in Soweto, have been invited for trials at Solihunn Moors F.C, which plays in the Conference League. Kgosi Dolamo who has also been in the program was also invited to Sweden by Djurgardens IF. The academy was formed in April 2010 in Soweto Meadowlands Zone 1 by former professional player Dira Laka and Lawrence Mashigo. Letsholonyane and his organisation, the Yeye Letsholonyane Foundation, together with the Footprint Foundation have been funding the team and playing a major role in helping with the development. Meadowlands Academy have seven youth sides from Under-9 to U-19 level, as well as an open team. Orlando Pirates are currently showing the most interest in signing Marc van Heerden, according to a source close to the in-demand left-back. Bidvest Wits, SuperSport United and Platinum Stars are also keen on recruiting the AmaZulu defender. His club, however, value Van Heerden highly, reportedly placing a R4 million price tag on the South Africa international. The 27-year-old has a year left on his contract with Usuthu, who are buying Mpumalanga Black Aces' PSL status. Former Orlando Pirates midfielder Thulasizwe Mbuyane is preparing to take Mpumalanga Black Aces to the PSL DRC for an unpaid signing-on fee. 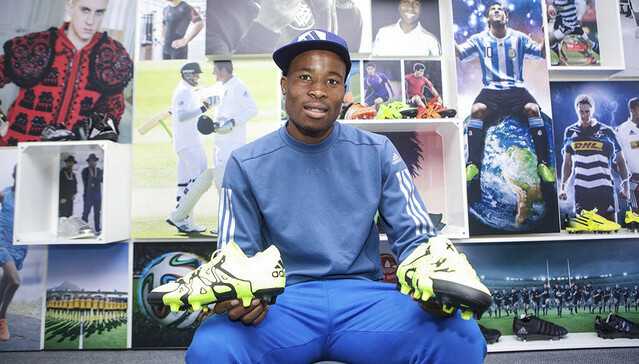 Mbuyane joined Aces from Pirates in January last year before relocating to Durban to join National First Division side Royal Eagles in August. However, ‘Juju’ was forced to retire from football in November last year due to ongoing battles with epilepsy and is now pursuing a career in business. According to a source close to the matter, Mbuyane is allegedly owed close to R500 000 by AmaZayoni and the matter is in the hands of the players’ union. Polokwane City have decided against retaining Joseph Musonda, whose contract with the club has expired. Musonda joined City at the beginning of last season and went on to be the first-choice left-back, starting 22 games to become the League’s oldest most-active player at 38. The Zambian confirms that he has been handed his clearance letter but says he will continue with his playing career. Football ambassadors for adidas in South Africa received their newly launched X and ACE boots from adidas ahead of the 2015/16 season. 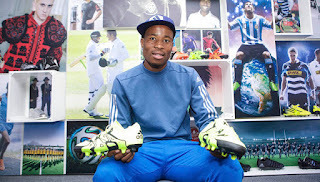 The likes of Happy Jele, Thabo Matlaba, Siyabonga Sangweni and other Orlando Pirates players are joined by other adidas-sponsored players in the PSL who will wear the new X and ACE boots next season. Kaizer Chiefs have revealed that Brian Baloyi will work as an assistant goalkeeper coach with the view to succeeding Rainer Dinkelacker when he leaves the club. Chiefs football manager Bobby Motaung said last week that Baloyi was set to return in a development capacity. The club has now revealed that he will also be groomed for the next six months to take over from first team goalkeeper coach Dinkelacker, who could return to Europe at the end of the year. “We welcome Brian back with us. He comes highly recommended by Rainer, who has done a tremendous job for us when it comes to the goalkeeper department. Rainer is on his way out and we are looking at a succession plan,” Chiefs chairman Kaizer Motaung told the club’s website. “Brian has the potential to become one of the best goalkeeper coaches in South Africa. I hope he will embrace this opportunity to work under the guidance of Rainer and give back to the club as well as our supporters.” Baloyi joined Amakhosi’s first team in 1991 and played 347 official matches, winning several trophies. Bidvest Wits have released Giorgi Nergadze following the Georgian midfielder’s struggles to play regularly at the club last season. Nergadze arrived with high hopes at the beginning of last season but only managed to play five games all season, with young Phumlani Ntshangase stubbornly holding onto the holding midfielder role. Nergadze’s representatives are searching for another club in the PSL but the player also has the option of returning home to rejoin one of his former clubs that have been keen on him since last year. Former Kaizer Chiefs anchorman Tinashe Nengomasha is ready to leave Mpumalanga Black Aces and intends to continue his playing career. The 32-year-old has not seen much game-time since his move from Bidvest Wits to Aces, making only 11 League appearances last season. The Zimbabwean, who signed a two-year deal with Aces in July last year, said that he is hoping for offers from other clubs. “I still have a lot to offer to football,” he says. “I still want to play. I enjoy football and that's what makes me happy. I am working very hard on my own. At the moment there is no team yet but I am ready for any challenge.” Nengomasha gave a decade of loyal service to Chiefs before moving to Wits at the start of the 2013/14 season, playing just eight League games.